With the days getting longer and the snow finally starting to melt, spring is undeniably in the air. And between my quick and easy guide to spring cleaning, tips to declutter your closet, and deep dive into the capsule wardrobe, it’s safe to say that I’ve caught the spring cleaning bug. I don’t know what it is about the spring season, but it has me ready to scrub my house clean from top to bottom. Along with a clean house, however, often comes copious bags and boxes of stuff that I no longer need. And while it feels incredible to free up space and weed out the excess, it’s also a bit overwhelming; what should I do with all of these items?? Since I have a feeling I’m not alone in this department, I decided to create a round up of resources and suggestions answering that very question. So if you’re wondering what to do with all of your decluttered items, then you’ve come to the right place. Given my love of all things creative, I thought I’d begin with a less conventional suggestion: DIY. Yep, rather than adding your stuff to a landfill, head over to Pinterest and get your DIY on. Search the word “DIY” followed by one of your extra items, and see what comes up! When I did this, I first typed in “DIY old clothes,” and I found this fantastic no-sew t-shirt tote over at mommypotamus. Seriously, how creative is that?! Not only are you reducing waste by repurposing an old shirt, but you’re also reducing the need for disposable shopping bags. It’s a double win! Then, I typed in “DIY old dishes,” and my eye went immediatly to Erin’s amazing DIY bird feeder. I mean really, there’s no end to people’s creativity. So before you toss out your decluttered items, ask yourself: can I use this in another way? And if you’re stumped, head over to Pinterest or the DIY Network. You’re bound to find a fabulous suggestion in no time. If you find you can’t reuse your decluttered items in a different way, then it’s time to recycle. And fortunately, there are so many great resources out there for you to use. Habitat for Humanity (habitathm.ca) is a wonderful option, and this is especially true when you’re donating large items. In fact, they’d love the chair and desk you’ve kept since college that’s now gathering dust in your garage. They’d also be thrilled to receive that empty hutch in the hallway that stops you from opening the front door all the way. Often organizations aren’t equipped to handle such large pieces of furniture, so if your donation pile includes big items, keep Habitat in mind. I’ve mentioned the Vietnam Veterans of America in several posts, because they’re a fantastic resource. Not only do they help take care of our vets, but they also make the donation process SO easy. In fact, they come directly to your house to pick up the items. As a heads up, they don’t take large furniture or appliances, but they welcome pretty much anything else. Just schedule a pickup online, and you’re good to go. If one of the above options is not available where you live, reach out to a local organization in your area. I know many local shelters, churches, and fire departments are happy to take donations. Essentially, Freecycle is a website that makes it easy to get rid of your stuff by giving it directly to someone who needs it. If this sounds up your alley, be sure to check them out! If you’re looking for a way to make a few bucks from your decluttered items, you could list them with either Craig’s List or Facebook Marketplace. Alternatively, you might hold an old school garage sale for people in your area. Each option offers an easy way to bring in a few well-earned dollars after all your hard work decluttering. 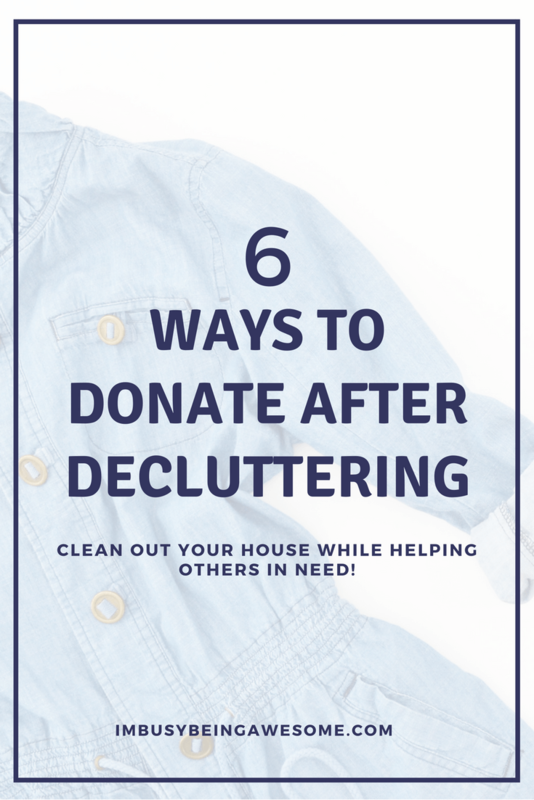 And that’s it, friends, my 6 favorite ways to donate or repurpose your decluttered items. Help someone in need while keeping the excess out of the landfills. Are you looking for more strategies to live an echo friendly life? Check out my post How to Live a Greener Lifestyle. Then, download my cheatsheet for 80 simple ways to go green here! What are your favorite ways to get rid of decluttered items? Have you started your spring cleaning yet? 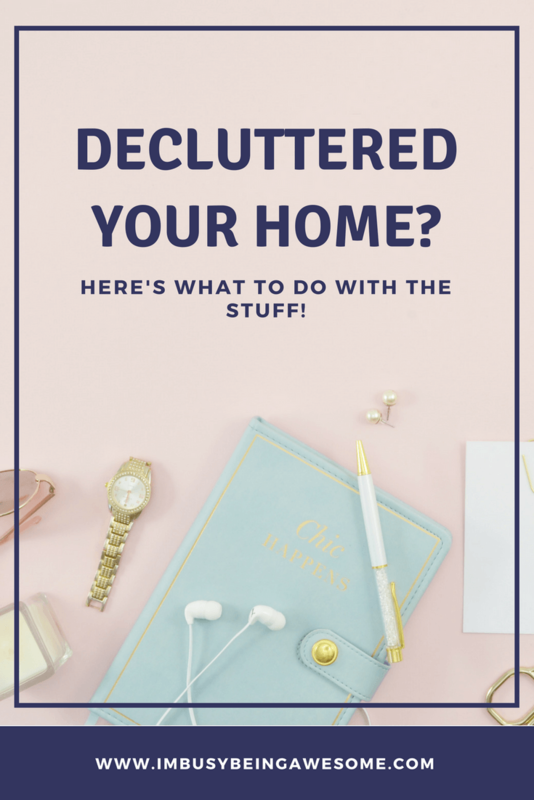 Do you enjoy the decluttering process? Let me know below! I want to DIY a bunch of jeans 🙂 I consign my childrens’ clothes and donate mine. I have been trying to send some of mine to ThredUp, but they have an insane wait list right now. I have bins for old toys/stuff so I have it ready when AM Vets comes through the neighborhood. That’s awesome that you have so many strategies, Emma! I like your suggestion of having a different donation bins at the ready, so anytime a group comes by, you know where everything is. Thanks for that tip! Such a timely post. I am planning to go through all of my clothes soon! Garage sales are super effective in our neighbourhood so I definitely get rid of household clutter by holding one annually. However, I do like the idea of getting creative and turning something old into something new through a neat DIY. That’s excellent! 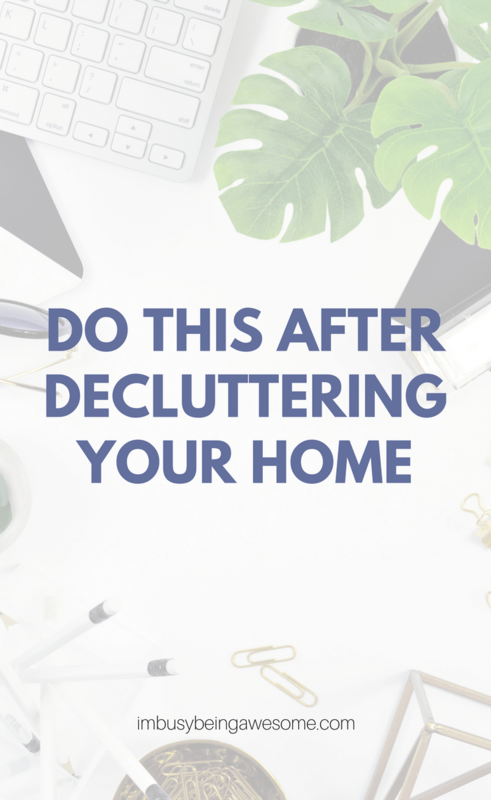 You get to declutter, make a little cash, AND meet your neighbors. I love it! Never heard of Freecycle before, but what a great idea. Going to look them up to see if they’re in my city.